Since I became involved with the warbird community as a photojournalist, I have had the opportunity to attend a good number of flying events, most of which have given me the chance to fly as a “PhotoGIB (Guy In Back) with many different pilots, in many different planes. To be honest, I’ve been having a blast! I’ve been taking photos that, a couple of years ago, I could not have dreamed of. I’ve been able to attend major aviation events, such as Sun ’n Fun and Oshkosh, not simply as a spectator, but as a participant. And, through my writing and photography, I’ve been able to give back, in some small way, to the community that has warmly welcomed me. Yep, it’s been a blast! I have also been able to share the story of my adventures, primarily through the magic of Facebook. I receive a lot of positive feedback, both online and in person, confirming that there are a lot of people who really enjoy my photos and my stories. After some urging from a couple of special friends, I have decided to expand coverage of my adventures by inaugurating a blog. I have plotted out an ambitious schedule of events for 2018 that will include the two biggest air shows in the United States, and, if all goes well, a trip that will not only take me around the world, but will take me to the Southern Hemisphere, then back north nearly to the Land of the Midnight Sun. I’ve given a lot of thought to how to begin this blog. I wanted my first blog entry to be something compelling, challenging, and thought-provoking. And I wanted it to be something meaningful and something that would make you, the reader, feel good. I wanted my first blog entry to be something that not only came from my heart, but would make you want to visit it again on a regular basis. In January, I got my wish. One random act of kindness led to a series of events that opened my eyes to a whole new world within the warbird community. Before I realized it, not only was I witnessing something special, I was blessed to be a part of it! Even better, maybe through this blog I will have a chance to make a difference to someone. Time will tell. I always knew that the warbirds had a much more important mission than giving a bunch of lucky aviators a chance to play with some really neat toys. I saw a manifestation of that understanding in December when I flew to Manteo NC (MQI) with the Berlin Airlift Historical Foundation’s C-54. At Manteo, I watched as BAHF President Tim Chopp demonstrated the fulfillment of his dream. He has successfully transformed his C-54 into a living, flying museum dedicated to the brave men and women who participated in the greatest airborne humanitarian event in history. Nearly 400 school children from North Carolina’s Outer Banks visited the “Spirit of Freedom” that weekend and had a chance to touch and feel a piece of history. It made a great impression on me. 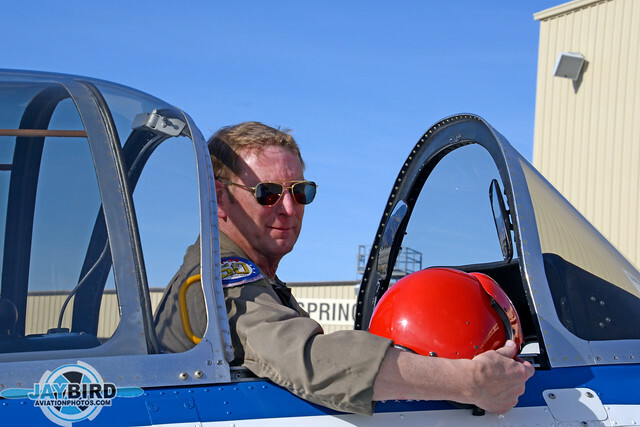 Then, at the Meeting of Mentors at Palm Springs CA (PSP) in January, I had the privilege of flying with T-34 pilot and owner Ron Alldredge as his PhotoGIB. Ron certainly made me feel welcome as a valuable crewmember, and we ended up having two excellent formation flights as “Mentor Alpha Two” in a four-ship formation. While the flights were good, and I was able to take some terrific photos of the other planes in my flight, Ron’s actions on the ground left me with a lasting impression of what it should mean to be a warbird pilot and a mentor. In some ways, I am still an “FNG” (Fun New Guy) in the warbird community, but I’ve been around enough to form some impressions. Once we all parked back at the museum, the ground crew opened the ramp to spectators. It didn’t take long for Ron to find himself with two gentlemen, Bruce and his buddy Dave. Bruce mentioned he had last flown a T-34 in 1957 as a cadet at Marana AFB in Arizona. That was all Ron needed to hear. In a show of compassion and understanding, he invited Bruce to have a look in the cockpit. These days, Bruce doesn’t get around very well, so Ron patiently helped the older gentleman up onto the wing so that he could gaze into the cockpit. Having done that, Ron suggested, “Go ahead. Climb in. Make yourself at home.” Now THAT brought the world’s biggest smile to the old aviator’s face! As Ron went over the cockpit instrumentation with Bruce, I had the presence of mind to snap a couple of pictures. The two aviators probably spent a good 10 minutes in the “front office,” no doubt reliving memories from 60-plus years ago. Once Bruce climbed back down, he, Dave, and Ron posed for a couple more photos in front of the T-34. Clearly, this brief encounter had touched all of us. As Bruce and Dave walked away, I thought back to my own childhood, in the days long before fears of terrorism turned airports into sterile fortresses. Back in those days, airplanes and pilots were easily accessible to mere mortals like myself. That accessibility played a major role in feeding my passion for aviation. Today, only a fraction of those opportunities are available to someone bitten with the aviation bug. An air show such as the Meeting of Mentors is one of a dwindling number of such opportunities. That evening, as promised, I sent an e-mail off to Dave, which included a couple of the photos I’d taken. His response warmed my heart. Dave and Ron both gave me permission to share the e-mail. When I first wrote this story, it ended here. It was already a good story. But the best part was yet to come. 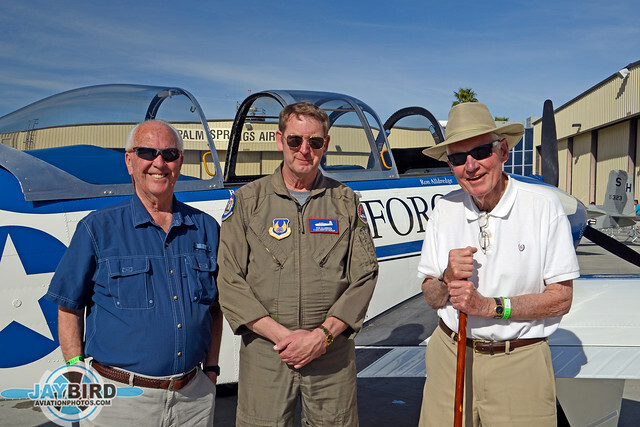 On Wednesday, February 21, Ron sent me an e-mail, telling me that he was going to fly his T-34 from his home airport in Tehachapi CA (TSP) to Bermuda Dunes CA (UDD) to treat Bruce to a flight in the Mentor. This was planned for Saturday, February 24. On Friday, I flew out to Ontario CA (ONT), and drove to UDD the following morning. Before long, we were all there. I joined Bruce and his wife Judy, Ron and his wife Paula, and Tyler. When the FBO reps heard the story behind what we were doing, they took a great interest and gave a real priority to the needs of our flight. Kudos to the FBO staff at UBB! Ron Alldredge’s beautiful T-34, N134LM, with a very happy Bruce Walker in back. All too soon (for Bruce! ), we touched down back at Bermuda Dunes. Bruce and Judy invited us back to their home for lunch, and we all sat around the table trying to get a real understanding about how and why this all happened. The answer to “how” begins with Ron. He is easily approachable, and it was probably that “approachability” (and standing next to an eye-catching T-34!) that drew Bruce and Dave to that particular pilot and plane. Usually, you can just look at someone and know if they might be interested in talking, and Ron has that look. It was that same “je ne sais quoi” that made me realize that something special was happening between Ron and Bruce. When I’m around airplanes, I tend to get target fixation with my camera. I focus on the airplanes, and not the people involved with them. But something caught my attention as I focused on Bruce sitting in the front seat, and Ron hovering above him. Dave saw me taking those photos and asked me to send a few to him, which I’d already planned to do. We were all on the same page. Ron Alldredge has a greater impact on others than he gives himself credit for. I don’t believe in coincidences. One of my favorite sayings is, “It’s a lucky man who hears opportunity knock. It’s a wise man who opens the door.” That would certainly apply to my life as a warbird photojournalist in the past year and a half. Here’s an amusing fact about that day at Palm Springs. There were two sorties that day. 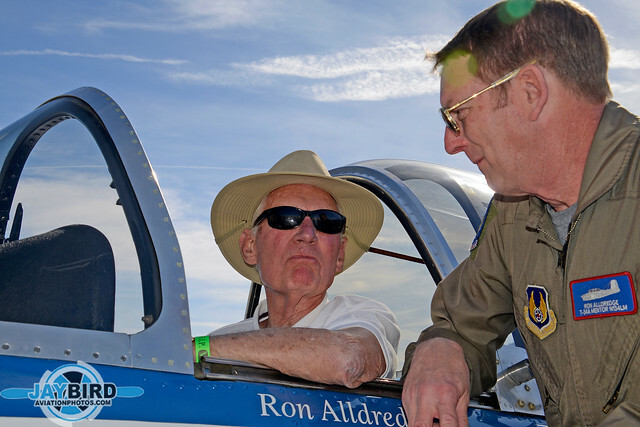 I flew with Ron on the morning flight and was actively looking for another pilot to fly with on the second flight. This was not because I didn’t want to fly with Ron again, but because I was hoping to photograph some different planes. But, at the last minute, I could not find anyone else, and Ron graciously offered me his back seat again. I am so glad it happened that way because I most likely would have missed out on one of the most meaningful events of my year. Coincidence? I really don’t think so. I was supposed to be where I was. Clearly, Ron Alldredge understands this. And now, in some small way, so do I. If one warbird driver reads this and, as a result, makes a difference to someone else by virtue of a random act of kindness, no matter how small, then I will have achieved something useful here. Thank you for visiting. I will endeavor to bring you photos—and articles of interest—updated on a regular, if not daily, basis. I welcome your feedback.